Happy New Years to you all. Wishing you the very best for 2014. 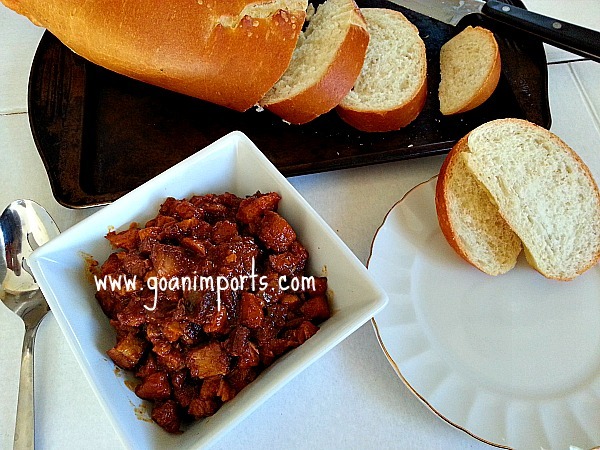 Every Goan knows what Sorpotel is and every visitor who has eaten sorpotel wont forget about it. It is the center for all celebrations in Christian household and a lot of it would be eaten during the Christmas season. 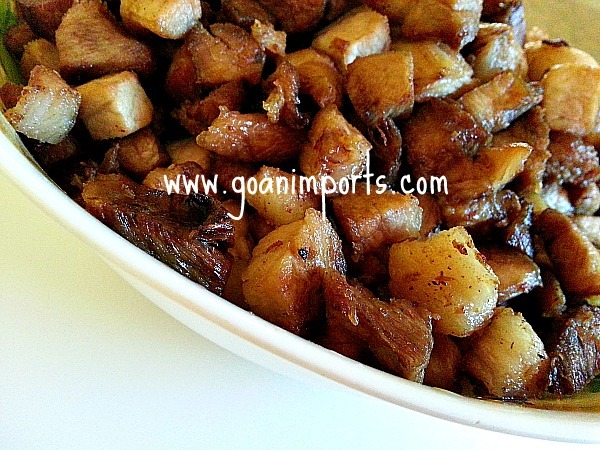 This dish originated in Portugal and is still cooked in Goa. Traditionally it is made with pork meat and the internal organs and some pork blood as well. This recipe has its variations in each household. I have adapted the recipe for people like me who are not so adventurous to eat the heart, liver and kidney. I loved the smell of sorpotel growing up but could not handle the internal organs. So my recipe is made only with pork meat and fat. To make sorpatel or the spicy pork curry the meat is first boiled. Then sautéed in its own fat in small batches till light brown and finally cooked in a spice mix that is ground in coconut vinegar to make the curry. 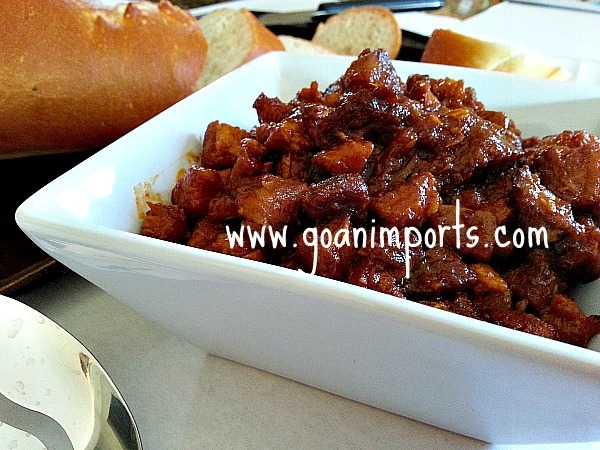 You can watch Andrew Zimmern show on Goa to understand a bit more of Goan culture and this dish. Sorpotel is features around 1.38 minute on the video. This recipe can be made a day or 2 ahead and it taste better as days go by. It also can be frozen for a couple of months. Give it a quick boil every time you want to eat some, as it taste better. 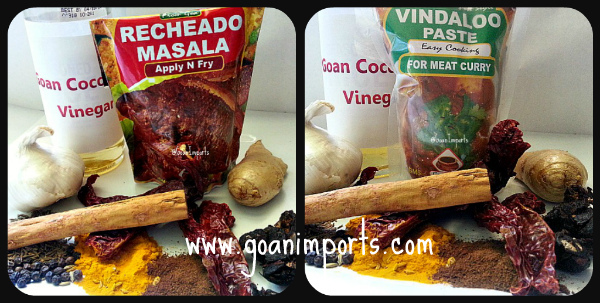 For this recipe you need a combination of 2 masala. That is the Vindaloo and Recheado. * Wash the meat and dry it with paper towel. Apply 2 tbsp of salt and keep aside for 15 minutes. 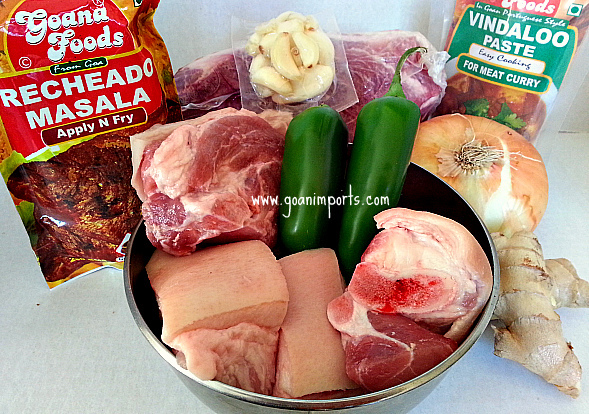 * In a pot add 4 cups of water and the salted meat and boil it for 25 minutes covered on medium heat. Do not discard the stock. Make a paste with garlic, ginger, green chilli and vinegar. * Take the big chucks of meat and cut it into small pieces as big as the size of a dime. In a heated non-stick pot add the dice meat in small quantity and saute in its own fat for 4-5 minutes till it browns. * In the same pot fry the onions in the pork fat till light brown. Add the ginger garlic paste, saute for 1 minute. then put in the vindaloo and recheado masala and saute for 3-4 minutes till you can smell the spices. * Next add the meat and saute for 10 minutes. Add the stock, sugar and salt to taste. Cook covered for another 30 minutes on medium heat stirring occasionally. Traditionally Sorpotel is eaten with steam rice cakes called Sanna or with white rice. I am late to comment on this recipe. Nonetheless better late than never. The point I want to make is that ‘SORPOTEL’ is the ‘PIECE DE RESSTANCE’ of any Goan meal. No feast or birthday party is complete without SORPOTEL. My spouse prepares sorpotel here in the UK all the time. It does not have to be a special occasion. We just have a big appetite for sorpotel. She will be preparing SORPOTEL on of these days. She is held up this time round because She has ordered for pigs ears and pigs tail and other internal organs for the sorpotel. So it is waiting game. I am kind of losing My patience. Yes You are spot on, when You said that sorpotel tastes better on the second or third day. In other words, it tastes better when it matures. After 4 months in Ahmadabad, I was pretty much a vegetarian when I got back to the US. But being a southern by birth, pork is so hard to give up. I love it! I totally get you :-). Watching all the southern food shows on tv I know it plays a major role in the southern diet.